When we first came to the Philippines, Ate Sheila and her children were one of the first families we invited to church. Now 6 years later, we have watched her and several of her children receive Christ as their Savior! For years now, she has prayed that her husband would be saved too! 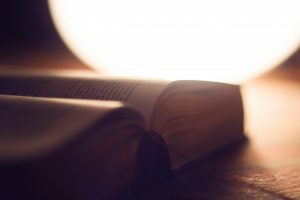 Just recently, he requested to have a Bible Study in their home. Pray for me as I try to share Christ with him each Saturday. He is asking some wonderful questions and has even invited some of his friends to join us. Just this week, all three of them came to our men’s fellowship at the church! Please pray for Poppa Timario! Pray that he would consider Christ and find salvation in Him! Some exciting news! We have been given the green light to teach in the public school right next to the church!!! A lady from the neighborhood was invited to our church and as it turns out, she’s a teacher at the high school next door. The next day she came back and said that she organizes a special religious meeting for Non-Catholic students once a month and would we be interested in teaching? In the future, they would also like us to teach a class for troubled teens every week! We are so excited about this opportunity to impact teens in our neighborhood! Please pray that God would continue to open doors and that many young people would find Christ! We were so happy for the opportunity to feed 70 plus children at extension classes! 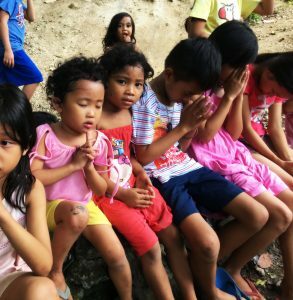 We want to help these kids, yes, spiritually and also physically! In Scripture, Christ often helped people with physical needs as a way to reach them spiritually. It was a blessing to watch these little faces as they enjoyed their food! We will continue to bring food to different classes in the coming months. Please pray for these children and their families! Pray that they would be saved and come to church! Here’s an excerpt from our last prayer letter, in case you missed this blessing! 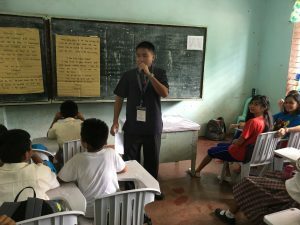 Great news from Bantayan Island! The Lord has given them a church building! 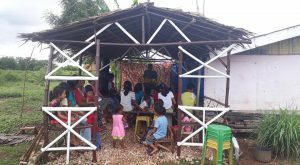 Families from Pastor Walter’s bible study came together and built a bamboo church building on their property. Others donated rocks for the church floor. During my visit in June, I was so blessed to see the work and help with the roofing. 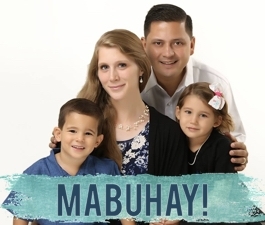 Thank you for praying for this church plant! This is another big step for them and we are so excited to watch God grow this ministry!